Ever since my family and I immigrated to this country from Peru, my main objective was to receive a good education. Anytime I tried to offer my parents help with work, they always gave me the same answer: “Your only job is to do well in school. Leave the rest to us.” Indeed, they made my “job” straightforward for me and my goal became evident from a young age—I needed to attend a great university and make my parents proud. Fast forward a few years to one of the happiest days of my life—when I got accepted into Georgetown University. A bittersweet feeling came over me as I read through the acceptance materials. Although I had gotten into my dream school, there was no chance we would be able to afford such high tuition. To my good fortune, the following week, I met a kind woman on campus who connected me with financial aid officers who quickly approved me for an incredibly generous scholarship. Thanks to her, my dream of attending Georgetown was about to come true. My transition to Georgetown was anything but easy. I always felt one step behind my peers in my classes; they seemed to know more than me on just about every topic. I was also largely unfamiliar with important concepts critical to success in college such as effective study practices and good financial habits, all of which seemed second nature to many of my peers. Luckily, my parents paid for what my scholarship did not cover, but I still needed to work part time to pay for all other necessities. On top of having to balance my schoolwork with my job, I often struggled with the fact that as a Latino, I did not look like many of my peers nor could I relate to many of them. I had to work to find the right communities on campus that would lead me to success. Despite the hardships of being a first-generation student, a Latino, and a working learner, I never stopped fighting for that degree . 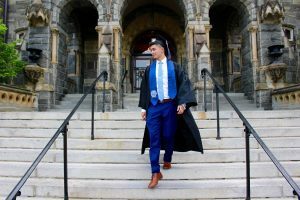 I was incredibly fortunate to receive guidance from altruistic organizations like the Georgetown Scholarship Program (GSP) that provided me with the moral and financial support I needed to push through the obstacles. In the end, as I was walking across that stage, every sleepless night, every tiring day, every demanding semester I experienced in my four years there were suddenly worth it because I was finally graduating debt-free from my dream school. Had I not met that kind woman from financial aid, I probably would’ve made a huge mistake and turned down the opportunity of a lifetime. This is unfortunately the case for other first-generation students with similar backgrounds to mine. Although sometimes it might seem impossible to attend our dream schools, my story goes to show it is not. Seek out the right resources, ask questions, talk to people. If I can do it, so can you. Renzo Reyes is a consulting analyst at Accenture, based out of the Washington, DC office. 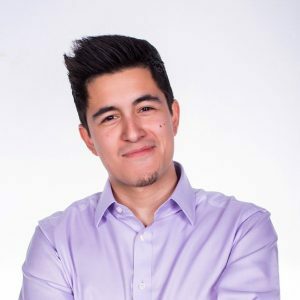 He is deeply involved with the Latino community both in and outside of Accenture, actively working to engage and empower Latinos across the DC Metro area and beyond. He is a proud alumnus of Georgetown University, where he studied Marketing and Finance.